What were Elizabethan Wedding Clothes like? What clothes were worn by the men and what type of wedding dresses were worn by the women? The bride did not wear a white wedding dress, this was a later tradition. Instead she would wear her best gown and kirtle , or even a new gown if the money was available. The gown would cover most of the body and would be full length. A cloak was used as an outer garment. Velvet, Satins and Corduroy were costly and therefore worn by the nobility. Although the vast majority of the body was covered it was permissible for dresses to have plunging necklines. A necklace was often worn which drew even more attention to a woman's breasts. 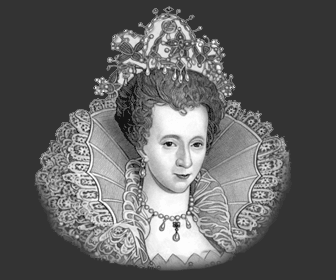 The necks and cuffs of gowns were decorated with silk or linen ruffs. The hair was often worn loose as a symbol of purity. The wedding garments belonging to the majority of brides were generally made from Flax, Cotton and wool. Colours came in a variety of different shades: red, blue, greens, white, grey, black, orange and tan. Corsets were occasionally worn but any additional undergarments were rarely heard of. A shift, or chemise, would also be worn beneath the gown. Fresh flowers were central to the clothing. The bride would wear flowers in her hair and they would also adorn her gown. Unmarried girls were allowed to wear there hair loose but once married it had to be hid beneath a bonnet. Wealthy brides had garments which were adorned with jewels and gold and silver thread. It was also traditional to carry a bouquet. A bride would have bridesmaids and these would be similarly attired. The Bridegroom wore his best clothes which consisted of a doublet, breeches, hose, box pleated neck ruff and a cod piece. A cloak might also be worn and a pair of boots. Elizabethan men usually wore a short shift as an undergarment. Velvet, Satins and Corduroy were costly and therefore worn by the nobility. The garments belonging to the common man were generally made from Flax, Cotton and wool. Colours came in a variety of different shades: red, blue, greens, yellow, white, grey, black, orange and tan . The colour of yellow would not be chosen for a wedding - it was a sign of mourning. A bridal procession would move from the family's house to the church. This was a particularly festive event and the procession would be accompanied by musicians.